For the analysis of one paddock up to 100 hectare, you will require one RHIZO-ID kit for each legume plant species. For paddocks larger than 100 hectare, we strongly recommend using an additional RHIZO-ID kit for better accuracy. Every kit contains four sample bags, for four individual locations in the paddock. 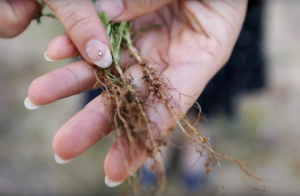 Previous research has shown that four locations per paddock provide a good overview of the rhizobia situation in that paddock. We are able to analyse the following rhizobia groups: Group AM/AL (Medic), Group C (Clover), Group FE (Pea, Faba-bean, Vetch, Lentil), Group GS (Lupin spp., Serradella spp.) and Group N (Chickpea). If your legume host/rhizobia group is not on this list, contact us to discuss the different options. For more information, watch our short video on the sampling process. We explain how to collect your legumes, and how to use your legume kit. Order your RHIZO-ID kit online. We proudly ship world wide.